Everyone seems to do one of these nowadays, and a lot of them look the same. I’ve tried to be different where possible and bring something new to the table. This isn’t a mock draft, it’s not even a definitive list. It’s merely a collection of guys to keep an eye on in 2013. Some will succeed and progress towards the top of next years draft. Others will fail in that quest. There’s also the chance for others to develop. Who was talking about Robert Griffin III twelve months ago? What about Cam Newton the year before? Things change during a season. One of the high profile absentees is Landry Jones – a player I firmly believe warrants no more than a mid-round grade. His tape was awful last year, and it’s why he didn’t declare despite being ridiculously placed among many top-10 mocks during the year. That’s not to say Jones can’t promote his stock with a good season, but he has it all to prove. Keep an eye out because over the next few weeks were going to start publishing game tape of this group. You’ll find all the tape by clicking the new menu bar tap titled, unsurprisingly, ‘GAME TAPE’. Just a fantastic quarterback prospect with elite technical and mental qualities. He could be the #1 pick. Thomas has all the physical tools and looks like Big Ben. The best pass rusher in college football, he had 13.5 sacks last season. A bit inconsistent and lacks ideal size, but he should put up big numbers again. The big question here is health. Can he bounce back from a bad knee injury? Elite potential but the motor runs a bit hit and miss. One to watch. Slingy release and gets happy feet, but he has all the tools. He would’ve been a late first or early second round pick this year. Jones can play multiple positions – tackle, guard, center. Teams will want this guy on their team. A player in the JJ Watt mould, he’s perfect for the 3-4. Another running back coming back from injury. It’s easy to forget just how good Davis is. I love Montee Ball. Watch the tape, he makes things happen. Another tackle off the Wisconsin production line. He could develop into a good one. Relentless and led the Buckeye’s for sacks last year. Underrated. Massive tackle who looks like Andre Smith in person. Could play tackle or guard. He looks the part of a #1 receiver but may be held back featuring in an offense that lacks explosion. Another prospect who could’ve been a first or second round pick this year. He can rush the passer, great speed and lean. Not the biggest but gets the job done. Incredible size but still looks athletic and can round the edge. A bit inconsistent and may be a linebacker rather than a pure pass rusher. He’s small, but the guy just makes plays. He’s hard to ignore. Reddick stood out more than Quinton Coples and Zach Brown last year. Just a solid linebacker, not explosive but the league will like him. The best safety going into the 2012 season and should be a first or second round pick. 13 interceptions in 2011 is incredible, but has is he fast enough to go earlier? Underrated linebacker who was fun to watch when scouting MSU last year. He had 10 sacks in 2011. May have more potential than Amerson as a more natural corner. It’s close. Athletic tackle who moves well and just needs to ramp it up a notch in 2012. The player I’m looking forward to watching the most for the Longhorns. He was a bit hit and miss last year, but this is the guy who replaced Russell Wilson. Not sure he’ll declare having missed considerable team his first two years. There’s something there. Another Alabama running back who is ready to dominate. Injuries stopped him from declaring last year. He still has talent. Huge safety who hits and can run. So what the league is looking for right now. Wilson should thrive under Mike Leach. He looked good last year and was productive with eleven sacks. Could be the big riser at tackle this year. Watch this guy. Another huge, athletic tight end. He’s 6-8 and can get downfield. Lots of potential here and another year as the starter under Dana Holgorsen should help. Big with ideal size, Gholston is ready to have a big year. I loved Knile Davis 2 years ago on that offense with Ryan Mallett, he’ll be a full year away from his injury ankle injury in August. Montee Ball is also a favorite of mine and I thought he would have gone ahead of Doug Martin and David Wilson had he come out. Even though the Seahawks are pretty set at RB I’ll have fun monitoring these guys next year. Thanks for putting this together, Rob. And thatnks for skippng the mock draft format….just perused the old “walter Football,” I think me and Wlater Football will be taken some time off….it’s not them, it’s me….or something…no, that’s not it, it’s totally them, and their bullsh@@ mocks, and near crybabying that teams (particularly the Hawks) don’t use their big boards….. So after this last draft cycle, I hope you and kip come with more ammo, becasue now this is basically my only source of info for college prospects…. We’re here every day Peter… always will be. Loads of game tape already ready to publish on 2013 prospects. Talking about 50 videos already. And when the season starts in September we’ll be back watching 5-6 games a week. I’m totally with you Peter. 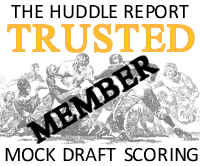 I placed confidence in Walterfootball for Big Board positions, prospects and Mock access. It did provide a wide range of information, but it started to appear to have an east coast bias and certainly rarely had a handle on the atmosphere of NW football. I have had up to six tabs set aside for football sites. I have switched to nfldraftscout.com for fairly thorough info on players even the most obscure. But of course SDB.com is my primary source for the best info and input on the Seahawks. Walterfootball has also openly admitted to not liking the Seahawks, so there is some of that involved as well. Fieldgulls.com has A TON of info with the benefit of coming from multiple perspectives. Not a knock on SDB, but I feel that when you’re trying to learn about anything you should look at it in a few different ways, which I don’t really think SDB can do because less people contribute. Siously my man, you have really upped my level of understanding of the college and pro game…and un-humbly I thought I knew quite a bit. I’m pretty stoked to see the clips (already started I know,) especially more Logan Thomas, adn Tyler Bray…..Matt barkeley is the man, to be sure, but it’s always good to check out more names….How strange is it that if Flynn/Wilson Pan out…I mean really pan out the Seahawks could seriously draft BPA all the time in the future, and just keep on loading up like the good teams get to….could be amazing. That’s the dream, Peter. To be in a position like Baltimore and Pittsburgh always are… to draft smart. Who is the best player who has fallen to us? We’ll grab him. That’s how those two teams constantly re-load in the AFC North. Let’s hope Seattle gets there soon enough. To get there though, like you say, they’ll need a legit starting quarterback. I don’t completely agree, after all you aren’t going to spend more than 1 pick on a QB if you don’t have a QBoF, so if you have 10 picks like this year, you still have 9 to use on BPA.. Unless of course you mortgage all those picks to move into the top 5.. I noticed John Simon on a post you recently did of Wisconsin vs. OSU. Wow. I’d love him on my team. Nobody talks about that guy, which surprises me. William Gholston is Vernon Gholston’s cousin, for those wondering. Not that it means anything about William’s prospects. Rob – glad you picked Geno Smith for the board, he is my favorite Qb for 2013. Excluding QBs, who from this list are you guys rooting for the most? I’m really pulling for Seattle to end up with Jarvis Jones somehow. Getting Irvin and Jones on this defense would be unbelievable. That would be wicked awesome. So much uncharted territory for me here. I like Werner so far maybe he could be a disruptive 3 tech. David Emerson kinda reminds me of a PC type cornerback. For some reason I think if we can’t get one of the top tier qbs we will be going defense in the 1st round again next year. I have to go with Jones, since ROb had him up on the site, priot to his returning to college. That guy to me is awesome…. I hate this term becaue it can mean so many things, but I would like to see the Seahawks pursue a “game changing,” WR……in my mind it’s someone about as big as BMW and RICE, with greater speed then the former and a bit more resiliency then the latter….But then every team wants a guy like that…..
Marquess Wilson worries me, because 183 lb on his frame seems pretty slight to me. Plus Leach’s offenses producing wicked good numbers, but perhaps not a ton of pro-ready talent…. One of the things that is striking about WRs, is just how fraught with failure they are. 2010 and 2011 were pretty lousy years for getting a game changing WR. At least one that appeared destined to be so. Who are some of they guys you think would have had that size and resiliency? It’s one thing to just say “I want” like a Veruca Salt, but it’s quite another to actually get one. Going back 6 years, you really only have 3 prospects that were these great WR prospects. 2 of which had this size/speed or skill to be labeled game changers (Calvin Johnson, Michael Crabtree and AJ Green). You can look pretty much as far as you like and you’ll see the god awful miss rates even on first round WR talents. It’s such a mercurial position that even with an astute eye for talent, it simply takes volume of picks year over year before finding a quality talent. Even Green Bay, with many talented WRs, doesn’t have the combination of attributes you ascribe to a game changing WR. They are just very very rare. And most don’t make it out of the top 5. Truth be told, game changing WRs are easily more rare than franchise QBs. Over half the teams in the league have a franchise QB. But probably only 4-5 game changing WRs exist at any given time. Jones was a guy I hoped we could land this year before he elected to return to school. So yeah I’d still like to see him here. I considered him the best pass rusher in 2012’s eligible class and barring catastrophic injury, there’s little to indicate he won’t continue to be so. If he is dominant next year, he’s going to have a pedigree at rush OLB not unlike Luck established at QB. Amerson is a guy that would fill out the secondary well. Given the rarity of size and talent at corner, it’s not wise to wait until you need a big corner to decide to get one. Amerson would be an Irvin kind of pick, in the sense that he’d be Browner’s successor as Irvin is Clemons’. Tall, angular and excellent ball hawking skills. He fits what we have built to a T. Like Jones, if he follows up his 13 pick year with another dominating season, he’ll easily eclipse the quality of prospect that Claiborne was this season. There are however several 6’2″+ CB prospects in next years’ draft. It may well be a case where if we go that route, we end up moving back. One thing I think we can say is, when it comes to CBs, this brain trust knows how to pick them. Logan Thomas. This past year, he seemed pretty comparable to Tannehill. Better as a pocket passer with a much superior arm. Tannehill was a senior though and Thomas a sophomore. I know we’ve put forth the idea of a ‘point guard’ QB. And really, it feels like either Flynn or Wilson can fill that bill well enough. Thomas however has high ceiling written all over him. Thomas has a very good first year under his belt. Adding to that would elevate him from the lack of consistent greatness class and into sustained excellence. And he’ll still probably be seen as having a lot of room to grow. Tyler Eiffert — A lot of teams are showing the benefit of having 2 threats at TE. Those teams are generally finesse/soft teams despite the 2 TEs. We are a team that runs a ton of 2 TE sets, although namely as a running tool. Eiffert is a Fleener type of skill receiver. But he’s also an excellent blocker. This year is important to establish his consistency. His 2011 season was already extremely impressive. We want touchdown makers, and Eiffert can definitely be that, as can Miller. Adding Eiffert would allow us to force mismatches in both the pass and run games from either side. It’s a best of both worlds kind of talent mismatch that happens to fit what we want both in the run game AND the passing game. These three kind of stand out to me as excellent prospects that match the kind of team and identity we’re building. Not necessarily at positions of need. But certainly capable of adding depth by pushing existing starters into a depth role. I know some fans are banging the WR drum. But if we weren’t thrilled with this class’ WR selection, then next year should probably be even worse. As it stands today weeks after the 2012 draft, there aren’t really many/any WR prospects that would have graded much better than what we just saw taken in round 1. There are a couple that if they follow up good seasons will undoubtedly rise. Certainly one or two could pop and explode in their development curve. But as of today, there isn’t this sense of ‘I wish this guy had come out this year’ to this crop. I fully expect the Carpenter experiment at RT to falter. I believe he will get IRed after week 10 when he comes off PUP. Additionally, even Okung fans (of which I am one), will concede that Russell has been at best very unlucky in that regard. If we thought our team was deficient at the OL going into 2011’s draft then at this point, I can’t see how that’s changed. We have better depth but no headliners. Injuries notwithstanding, the team still needs push and protection from this unit if we want to play the way we intend to. OL at this point already should be seen as a position of need. Some good points about the WR…interesting to note that Crabtree had the “look” of a number one but as yet hasn’t done any damage in that regard yet…maybe never? It’s hard for me this year to ponder the QB situation, though I’m always interested to see the ebb and flow through out the season to see who is rising. I feel that some team will fall in love with Logan Thomas and see Big Ben part two/slower Cam newton and take him pretty high. I’ve seen the comps to Tannehill but Thomas is way bigger then Tannehill, and has a ridiculous looking arm, just easily making strikes in the intermediate routes like his playing around in a back yard. I’m not sure that I follow in regards to depth and “headliners,” on the Oline. For every case to be made for amazing Oline talent, and I do beleive there is one to be made, the case is made via the Giants, The packers, the Steelers that a line full of top tier talent isn’t always necessary. True each team has some good talent, and yet each team has some late round fliers on it as well. It’s hard for me to pass judgement on our line yet starting with Okung, since Unger didn’t really pan out until his third season, and last year I thought Okung was starting to get it. Moffit, will be back, and Giaccominni isn’t the best pass pro, but his run blocking is prretty good. First, I am in no means advocating dumping first round picks on the o line. I do not believe the difference in expected outcome from a first round talent and a 2nd/3rd round talent is that pronounced. As to the examples provided, we should probably compare like talented teams. All three of those teams have elite QBs. The only one that didn’t have elite production (Steelers) suffered significantly this year and I would note, they did in fact take an interior O lineman for the second time in 3 drafts. Rodgers and Manning have reached skill levels where they can be responsible for protection simply because their ability to get rid of the ball and more importantly, make defenses pay for blitzing. Even though I’m not enthused about taking a tackle in round 1, I think we’re at the point where there is enough doubt to Okung’s and Carpenters ability to perform (either durability, skill or both), that we should get ahead of the problem before it costs us seasons and retards development of young QBs. Our overreaching plan, was to invest in the Offensive line, so that it would provide an environment where developing a QB would be fruitful. At this point, our investments are at best unknown, when by this time we should feel good about what we have. Carpenter’s ability to move inside is a bonus in this case. Getting another tackle that has the ability to anchor the left side would be a great hedge on what is at this point a risky return on investment. If let’s say, we take a LT, and Okung’s early injury results prove an anomaly, then we can move that LT to RT. If likewise, Carpenter also recovers and also develops into what we thought he was turning into, then he can move to guard. On the other spectrum, if Carpenter or Okung (or both) end up continuing to struggle to stay on the field, then that LT you took is plugged in straight away with little impact. Obviously we have players on the team right now, that are suitable medium term replacements on the right side. Whether you or I believe top tier talent isn’t needed (we basically agree on this), the fact is Carroll believes it is. He spent his top picks in consecutive years at the tackle position, and made resigning our effective backups the first priority in this offseason. So I’d be willing to bet that barring a QB option, if we don’t get a full season from either Okung or Carpenter this year, we’ll find ourselves in the market to make good on the intended upgrades from 2010 and 2011. If we are, then it is shaping up to be a potentially good draft for one. It does look deeper than this years’ class, but will be dependent on some juniors electing to come out. I could see if both falter this year to injury then uprgrades could be the word of the day….But it’s still hard to say since Carpenter won’t even be back this season barring a miracle. So if Okung gets injured again I could see what you are saying. that we would need a LT, though I’m still not sure that would be the way to go…if…..A top tier TE/WR/CB prospect was available. As you stated above finding someone to replace Browner whether they play a bunch of special teams for even a bunch of years should be a priority, due to age. And though I love to root for the unknown and the under dog, I can’t get to excited for any one on the team who catches the ball besides Baldwin. Tate may blow my mind this year, Lockette and Durham as well. Maybe Sidney Rice just needed down time to get well, but as it stands, I haven’t seen anything that makes me think anyone of them couldn’t be improved upon in next year’s draft. Any chance Keith Price declares after the 2012 season? Does it depend on what kind of season he has? With Barkley, Thomas, and Wilson coming out, I guess it’s not the best year for him to enter the draft – of course, it’s so early any of those guys could drop hard. There is a chance but it will depend on what kind of a season he has and what kind of grade the committee gives him (remember, he’s only 6’1″, 195). Washington’s offense was destroyed by their defense in the Spring game, which is not surprising. There is a lot of flux on UW’s offensive line which was already bad to begin with, and while the Huskies have some weapons at RB, they don’t have a true workhorse back that can provide the same consistency Polk did. Without a quality running game, defenses will key on Price and make his life very difficult. Price could end up having a huge year or have a terrible year. It’s impossible to know right now. I’d say 80% chance he declares in 2014 and 20% chance he goes in 2013. Just a WAG, but that’s how it feels to me. Yeah, this will be interesting to see. Price’s numbers were *really* good last year–among AQ-conference QBs he trailed only Wilson, RG3, and Luck in QB rating, and with (IMO) a lot less help than any of those guys. If he repeats his performance and the defense improves enough to win a few more games, he should be a Heisman contender. The size is of course always going to be the biggest question. He’s said he wants to add muscle this summer and play heavier next year–we’ll have to see what he plays at this year and whether he maintains his speed and agility. And in terms of the height, is he “six-one” (meaning 6’0 1/8″ in reality), or is he actually going to measure out at 6’1″ plus? If he’s 6’0″ 195lb he gets Russell Wilson comparisons; if he’s 6’1 1/2″ 215lb he’ll look more like RG3 (I know both of those are really positive comparisons, but again, look at the numbers, and look at his head-to-head performance against Griffin in the Alamo Bowl…). I can easily see him regressing this year, getting pegged as too small, and looking like a mid-round pick at best. I can also see him coming out bigger and better and looking like a top-15 pick at the end of the year. I know it’s early, but next year’s draft looks to have a very strong first round- and it looks like an even better first round for offense than this year, which is saying a lot. Knile Davis and Montee Ball at RB. Three very good WRs just from the Pac-12 alone. At QB you got Barkley, Thomas, Smith, Wilson, Jones, Bray… maybe Price and Murray too that all have at least a chance for R1 consideration at QB. I’d prefer to see the Seahawks picking in the 20’s, but 2013 will be a very, very good year to pick before that. FSU QB Manuel might be one to watch. His tape last year was not good, but has the tools to be a difference maker and maybe a sleeper pick for next year. Manuel has a lot of improving to do IMO. As you say Justin, great tools and looks the part. But the tape was poor last year. He has a chance to make it right this year and boost his stock. Hey Rob, how much have you seen of Jordan Poyer, CB out of Oregon State? For the past two years he’s been a great return guy, even picked off barkley when they played at OSU, but he’s only started this past year, and faired pretty well, with NFLDraftScout.com rating him the number 3 corner of next years class. Not a player I’ve watched Charlie but thanks for the tip, I’ll keep an eye out for him. Can’t wait for a post on Toilolo, I found him very fun to watch on an admittedly conservative offense. I know this isn’t going out on a limb, but I feel like he’s got a great chance to be an every-down threat at the next level. Speaking of which, who’s next in line at signal caller for Stanford? Nottingham? A quick note about Marquees Wilson. Students and fans have pretty good access to the practice fields here on campus. I watched most of the spring practices, and I’ve gotta say, Marquees didn’t look great this spring. He appeared to have trouble getting separation from defenders and didn’t really flash the spark we’re used to seeing from him on Saturdays. Having said all of that, I think Marquees is one of the most underrated receivers in the conference, if not in the nation. His hands are amazing, he’s got deceptive speed and he has awesome body control. If Barkevious Mingo is even half as good as his name, there’s really no point doing a tape analysis as we will have no choice but to draft him. Can you imagine 65,000 fans raining down barking noises and BRUUUUCE chants?? Opposing quarterbacks will crap themselves before the ball is even snapped! A word on John Simon who I have at #14…. I cannot believe nobody is talking about this guy. He appears in none of the 2013 mocks I’ve seen or big boards. Bit like Bruce Irvin 12 months ago… annonymous, but will be a big names come next year. I know it’s very petty on my behalf, but I’m surprised to see Jeffcoat so low and no Alex Okafor or Kenny Vacarro on the list. The Texas defense is loaded and they have a great scheme. I think the two pass rushers have really only scratched the surface so far. Okafor was borderline to be #40 with Gholston. Vacarro I really like but I left him off this list as I’m not convinced he’s going to be a top pro-prospect. The Texas team has flattered to deceive a little bit over the last two years but we’ll definitely monitor this trio among others. Rob – that’s a nice list, Bjoern Werner is a little underrated though… I know it’s insane to project this right now but I fully expect Werner to be a top-3 pick next year. JJ Watt is not the right comparison at all, he doesn’t have half of Werner’s athletic ability. The closest comparison I can think of is actually Bruce Smith – high praise I know, but this guy has that sort of potential. I got to watch him work quite often living here in NW Florida and he does it all (and he was only a frickin sophomore). He has a quality similar to Suh, in that he just destroys his intended blocker in 1 vs 1 situations. Do you think you will be getting any film on Star Loulelei? I’ve watched a bit of crappy highlights, and wondering about two things…. 1. Will his age entering the draft push him down a bit?I don’t think he’s old, but he will be turning 24 in the tail end of his rookie campaign? 2. And I’m still not as adept by a wide margin as you in turns of scheme fit, but do you think he could fit or replace, or spell a player currently on our line? Basically before I get super stoked on the guy, I just am trying to find a little bit more, and though I like our Dline and don’t think there are to many weakness’ I also think a absolutely dominate player would be the final piece to send the whoe operation into another level. Ask and you shall receive… Star Lotulelei tape now on the blog. His age isn’t too much of an issue – especially if teams believe he can have an impact quickly. I think he’s a little overrated but with obvious physical tools. He needs to get stronger vs the run and he needs to become a more polished, technical pass rusher. But he’ll enter the year by far the highest rated three-technique prospect. He fits the bill as a three in Seattle’s scheme, potentially he would replace Alan Branch. But his run defense needs to be stronger. It’s hard not to come to the conclusion that unless Seattle uncovers another hidden gem in the pass rush department (Dexter Davis, Cardarro Law, Monte Taylor, etc., etc. ), they may look for another pass rusher next year whether Clemons continues to produce and re-signs or not. Irvin really just treads water from a roster standpoint because he replaces a piece that was missing last year in Brock. Assuming Irvin pans out as PC/JS expect and the fans hope, it’s hard not to not see a need for more of that. And if it is tough to find a guy with his raw talent past the high end of the draft, they will need to scrape all the usual areas to find more guys for tryouts.